Born in Lodz, Poland, Leon Hirszenberg was the younger brother of the renowned Polish-Jewish painter Samuel Hirszenberg, who originally instructed him in painting (some of Leon's early works are inscribed 'Noel' to distinguish his work from his brother's), and the brother-in-law of Henry (Enrico) Glicenstein. Around 1890 Leon went to Munich to continue his studies privately, later returning to his native city and exhibiting in Lodz and Warsaw. Around 1902-03 he left for Paris, frequently visiting Concarneau in Brittany, and probably through Olga Boznańska, meeting and coming under the influence of the painter Władysław Ślewiński. In 1905 Hirszenberg settled in the Breton fishing village of Perros-Guirec, exhibiting in Paris (including at the Independent Salon) and in Cracow, where he first showed work on Breton themes. 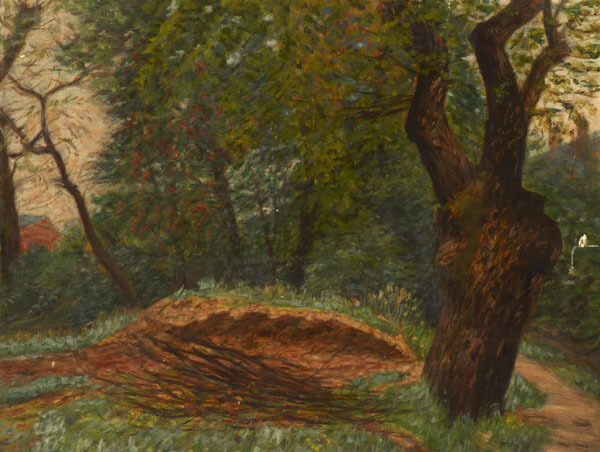 In 1930, when Ben Uri's Honorary President Leopold Pilichowski presented a number of Hirszenberg's works to the Collection including the landscape 'In Brittany', he was listed as residing in Paris although his death date is commonly given as c. 1912-15; recent scholarship suggests he died after 1932. This work was presented to the Collection by Ben Uri's Honorary President Leopold Pilichowski in 1930. 'Jewish Art and Literary Society Ben-Uri: Catalogue and Survey of Activities 1930' (24) 'In Brittany'.